To configure an interface to be an access interface, the switchport mode acess interface command is used. This type of interface can be assigned only to a single VLAN. To configure a trunk interface, the switchport mode trunk interface command is used. This type of interface can carry traffic of multiple VLANs. An example will help you understand the concept. VLAN 1 doesn’t have to be created, it exists by default. 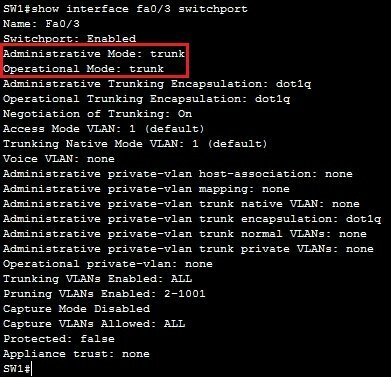 Also, by default, all ports are in the VLAN 1, so Fa0/1 doesn’t need the switchport access vlan 1 command.